NGC 5033 is a huge Seyfert galaxy with a mass of approximately 2 trillion solar masses. It has an active nucleus, and has a close massive neighbor, NGC 5005. This beautiful galaxy has very loose spiral arms that our splayed in a manner that makes the galaxy look a bit like an octopus. The galaxy also features a multitude of HII (star forming) regions - well over 400. In this image, North is to the right, This image is cropped to 57% of the original full frame. Software Used Images Plus 4.5 for camera control, calibration, stacking, digital development, multiresolution sharpening, smoothing and noise reduction. Photoshop CS5 used for levels and curves, color balance, high pass filter, star shrinking, saturation adjustments, screen mask invert, and noise reduction. Gradient Xterminator for gradient removal. Carboni Tools for additional saturation adjustments, noise reduction, and smoothing. HLVG for additional color correction. 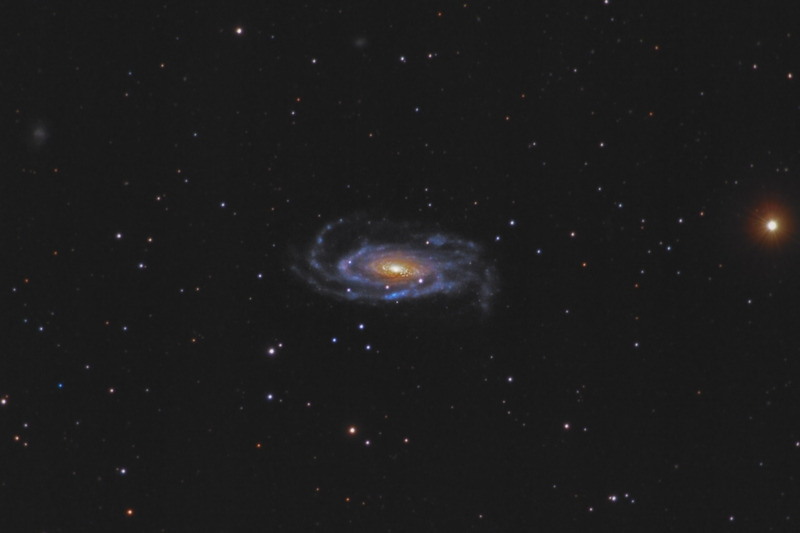 Notes NGC 5033 is a relatively low surface brightness galaxy, so this was a difficult object to image. I put a lot of imaging time on this object, and I think it paid off. Overall, I'm pretty pleased with the final result.